The NCAA Tournament is finally complete. 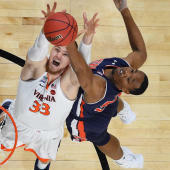 The Virginia Cavaliers have captured their first national title in school history after outlasting the Texas Tech Red Raiders in overtime in Minneapolis.The Wahoos overcame a first half deficit to No. 16 seed Gardner Webb and the demons of a season ago to be crowned this year's champions. After beating the Red Raiders, you can now relive the full 2019 bracket and see how Virginia made it all the way to the title, as well as how the rest of the tournament played out. CBS Sports brought you every possible angle during March Madness with live coverage throughout and our live bracket page. If you want to remember this tournament forever, print the official bracket and see just how every upset happened and how many picks you may have gotten wrong before play began. Thank you for staying with us for complete coverage throughout this three week journey across the country. Click here to enlarge and print the official 2019 NCAA Tournament bracket.